Arri Amira, uses the same sensor than ARRI ALEXA, fullHD, 2K, & 4k . Dynamic Range: 14 STOPS, natural colors. Up to 200 fps. This camera combines exceptional image quality and affordable CFast 2.0 workflows with an ergonomic design optimized for single-operator use and extended shoulder-mounted operation. With the same sensor and quality of ARRI ALEXA, AMIRA PREMIUM records fullHD, 2K and 4K images ( 4K UHD 3840x2160 with license, 2K 2048 x 1152; HD 1920x1080) on C-Fast cards (ProRes recording up to 4444) . Arri Amira allows the creation of LUTs in camera (apart from the possibility of using Log C & Rec 709), recording high speed up to 200 fps using the whole sensor. It has internal NDs (0.6, 1.2, 2.1) camera filters. Recording of audio in camera with its port of three channels IAOU.With a dynamic range of more than 14 stops, the AMIRA offers low noise levels, subtle highlight handling, natural color rendering and beatifull skin tones. A great thing about the AMIRA it is that it is suitable for a great variety of production types, from reportage and corporate films to TV drama and low-budget movies. This camera is built with a solid internal skeleton that guarantees camera and lens stability. Sealed and capsulated electronics provide top level protection against humidity and dust, while an integrated thermal core results in an exceptionally efficient cooling system. This ensures the correct performance of the camera no matter where you are and how hard the conditions of the differents locations are. If we are talking in terms of the usability for a single operator we would highlight the Quick start-up conditions that the camera offers with easy access control of the menu for both audio and image, its perfect shoulder balance with Sliding dovetails, the OLED eyepiece and fold-away LCD monitor and the easy control of the NDs internal filters on camera. The AMIRA also comes with a number of 3D LUT-based looks that can be applied while filming. You could even custom-build your own 3D LUTs in external color grading systems, load them into the camera during prep, and you could even modify them on set. This is a great option for wildlife filmmakers. The pre-record function uses an internal buffer in the camera to perpetually record a loop, you can configure the length of the pre-recorded footage. When the REC button is hit, the clip recorded to the CFast 2.0 card will include the specified pre-record period at its start. There are some situation where you will find this option quite usefull. Scenes that involves a change of color temperature during a shot(following a character from a tungsten interior to a daylight exterior) wont be a problem any more with this dynamic tracking option which makes automatic white balance adjustments. This adjustment is seamless and undetectable even for the most extreme color temperature transitions. Thanks to this option you can use display live the AMIRA´s LCD panel on another device such us a tablet, smartphone or laptop via wifi of using a Ethernet cable.The interface replicates the camera home screen menu. ARRI's Lens Data System® (LDS) generates highly accurate lens metadata for use on set and in post. When using an LDS lens on AMIRA's LDS mount,information about iris, zoom position or focus is visible in the viewfinder and the files will have lens data embeded in the recorded footage. This option allows the camera operator to monitor audio through wireless Bluetooth headphones. Also spoken comments can be recorded during filming by using a microphone-equipped Bluetooth headset. This could be usefull to provide guidance for postproduction tasks. This comments will be recorded in an independent audiotrack. The AMIRA uses a revision of the ALEXA Classic/XT image sensor, which ensure a great image quality with 14 stops of dynamic range, perfect highlight handling, an EI range of 160 to 3200 (ASA equivalent) at low noise levels and natural color reproduction with natural skin tones. The camera records HD, 2K or 4K (UHD) QuickTime ProRes clips with 4:2:2 or 4:4:4 color sampling, including 4 tracks of 24bit 48 kHz audio and camera metadata. The AMIRA Color Tool (Mac only) can create, modify and store AMIRA Look Files outside the camera. This software can read files from a library on the hard drive or import a custom 3D LUT created in a color grading tool or from the camera footage. 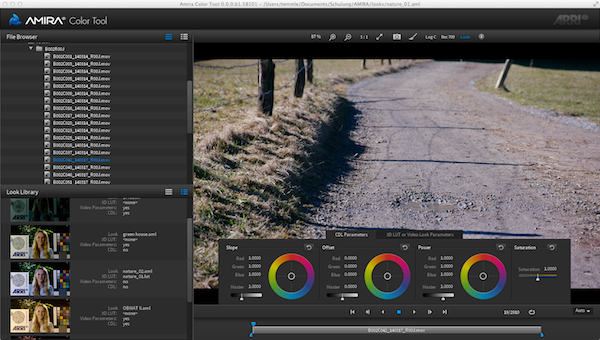 Using the AMIRA Color Tool will let you work faster and more convenient than the camera menu. AMIRA allows you to shoot your images in Log C or Rec 709 video, or with a customized look. Log C and video are two types of image encodings that usually are found in different production environments. Rec 709 Video delivers images that are ready for display on a computer, video monitor, or digital projector, without any further conversion. Log C stands for a logarithmic encoding of the high dynamic range scene data coming from the sensor. The digital numbers in a Log C image are proportional to the exposure measured in stops, which results in a very flat "data curve". Without compressed highlights and blacks, Log C encoding provides much more control over your recorded image. For a visually correct contrast and color representation, however, the Log C images have to be converted to the display color space (e.g. Rec 709 video or DCI P3). EVF - LCD + Support. 19mm Rods, long and short. Standard, Baby & Hi Hat. Matte box Arri ó Tangerine. La Cámara Arri Amira es extremadamente polivalente. Su Sensor es similar al de la Familia Alexa , Rueda Apple Prores 444 y hasta 200FPS. Su precio es ligeramente más económico que el de Arri Alexa Mini. He trabajado en varias ocasiones con las Arri Amiras de Camaleón. Siempre han estado a la altura ya sea por Sierra Nevada a temperaturas bajas o en una fundición en Valencia en pleno verano. Altamente recomendado este servicio. Aunque es un poco más pesada que Alexa Mini. Es una opción más ajustada de precio y ofrece similires cacterísticas en reproducción de color y velocidad de FPS. No permite grabación en RAW ó anamórfico.